Manuscript Art in Medieval Era. Conclusion. Before dressing up the conclusion, I am about to dig a bit with the Vaishnava manuscripts as one of the important aspects of our flowing discussion. Unfortunately, based on my assumption, there were no authenticated researches performed yet on the Vaishnava Manuscripts art moreover, it is accordingly difficult to find out the original Vaishnava manuscript. In the Bankura district of West Bengal, it has the possibility to have some oldest manuscript, however, there were no documentary articles published in regards to those manuscripts. Despite the above tricky position, we can easily recognize some of the important Vaishnava literature (scripture) perceived as the oldest Vaishnava manuscripts. Those are Bhagavadgita, Ramayana, Mahabharat, Garuda Purana etc but without having and research on this section, I unable to put down here the references of Vaishnava manuscript art. Indian miniature painting demonstrated Lord Krishna as Vasant Raga playing with Gopis . From the ancient time in India, the main center point of Vaishnava culture was, Mathura and Vrindavan, the birthplace, as well as the grew-up spot of Lord Krishna. Still, this place is not only obtaining the pride of Vaishnava culture but conveying as the center point of such a great section of the Hindu community. The surrounded area is known as Vraja-bhumi and the local languages also perceived as BrajaBuli, a bit different from Hindi. It has been a verdict of the historians that most of the kings of the Gupta era (375-413 CE) were adapted to the Vaishnava religion and own this culture. They even designated themselves as Parama Bhagavata. [most beloved of Lord Vishnu] Actually, from the ancient time, the Vaishnava community had been making influence widely that had a major impact on Indian culture and still, it is ongoing. Therefore, it is commonly assumable that it also had a great contribution to manuscript art. But without having any good reference, I unable to write or show anything more about such an important chapter. Despite the lack of availability of the Indian paintings in manuscripts of 8 to 1500 century, historians were unable to record properly the revolution in Indian painting; however, the influences of Indian style they got in Chinese and Tibetan art as the evidence of reciprocation. The streamy pathway of Indian style as affirmed by historians was from India via Khotan to China and later from China via Korea to Japan. As an instance, historians bring forth a historical event of meeting two Indian Buddhist mendicants with Yean-Tee, the emperor of China (605 - 617). The name of those mendicants was, - Kabhod and Dharma Kuksha. Later, so many artists visited China from India and other countries. But we have to keep in mind that Chinese art had its own style that already proved the translucency in the yardstick of artistry. Actually, based on the subject, we can arrange Chinese art into seven segments. More or less, Indian art only made an impact on the spiritual section of Chinese art out of the rest six parts. Although in another discussion of this blog, I stated that China followed the Indian grammar of painting, however, it is undeniable that the artists of China established the talent in their very unique style and language marked as ‘Chinese art’. Muhammad Bin Qasim leading his troops. As I previously stated that the manuscript art was the ancestor of the Indian miniature, but unfortunately, native Indian style did not recognize until the stream of Mughal style mixed up with the native Rajput style. 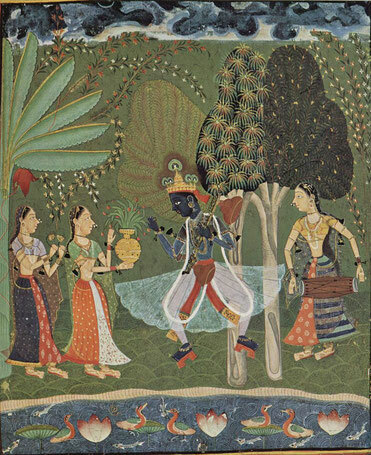 History described that on that era, a lot of Hindu artists were performing in India superbly. But there is a proverb, - Native sage doesn’t be recognized. Hence, we see, when Emperor Akbar invited some native Rajput artists and humbly placed in his court, Rajput art got recognition. As a piece of evidence, when Muhammad Bin Qasim conquered the Province of Sindhu, some artists attended his court and requested to order a portrait of him and his colonels. Such a bit of instance significantly confirmed that at the said time, it was a trend to draw good portraits and moreover, political disasters somewhat suffered such fashion but it was trying to revert again by the support of rulers. Indeed, with the kind support of upcoming Emperors, Indian art got the highest destination. The discussion is now completed and thanks to you for the interest you have been showing from the introduction chapter. Due to the inadequate information, It was tough for me to continue the discussion; however, I am now eager to have your precious opinion on Indian manuscript art. Do you think the Indian manuscript art was the ancestor of the modern book illustration? Do you have any other resources that can prove as the world's first concept of book illustration? Please share if you have some good information on manuscript painting and moreover, I need the information on the Vaishnava manuscripts because I have very minimal knowledge on it. Do you have? Finally, if you would like to appreciate my efforts, share the discussions to your preferred social channels to make it accessible in your followers and friends. Thank you. 1. Vaishnavism (Vaishnava dharma) is one of the major traditions within Hinduism along with Shaivism, Shaktism, and Smarthism. It is also called Vishnuism (paternal), its followers are called Vaishnavas (maternal), and it considers Krishna as the Supreme Lord. 2. Muhammad Bin Qasim was an Umayyad general who conquered the Sindh till Multan along the Indus River and then controlled for a short period of 4 years for the Umayyad Caliphate. He was born and raised in the city of Ta'if (in modern-day Saudi Arabia). Qasim's conquest of Sindh up to southern-most parts of Multan enabled further Muslim conquests on the Indian subcontinent. A member of the Thaqif tribe of the Ta'if region, Muhammad bin Qasim's father was Qasim bin Yusuf, who died when Muhammad bin Qasim was young, leaving his mother in charge of his education and care. Umayyad governor Al-Hajjaj Ibn Yusuf Al-Thaqafi, Muhammad bin Qasim's paternal uncle, was instrumental in teaching Muhammad bin Qasim about warfare and governance. 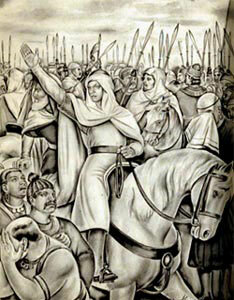 Muhammad bin Qasim married his cousin Zubaidah, Al-Hajjaj's daughter, shortly before going to Sindh.